OSMcast! Otakon 2013 9-2-2013 – OSMcast! 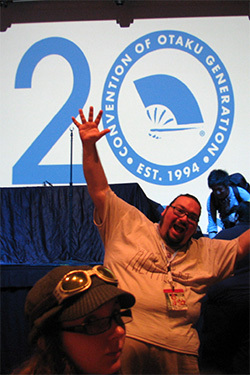 Con season* is upon us again folks and this time the OSMcast went to one of the biggest anime cons of them all: Otakon! The anime con SO big the city it is in can barely contain it. And so big, the OSMcast alone could not handle it. Well, we probably could but we thought it would be fun to chat about the con with some friends. And what better friends could we have asked than Daryl and Gerald of the Anime World Order podcast!? True friends, you know the kind that make sure to get their burger orders right, so that nothing terrible can happen. … As you listen, you may discover that we may not be the best judge of character, at least with THAT criteria! But all that, and more, so much more on this episode of the OSMcast! 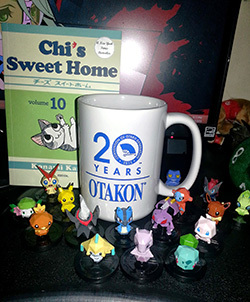 Here is the Otakon 2013 mug. The Chi’s Sweet Home is used for scale. Sorry for the couple of days hiccup, folks! But things are back on track! We would once again like to thank Otakon for their kindness and generosity for letting us cover their convention, and to thank Gerald and Daryl for taking the time to chat with us! Also we’d like to thank Ink for letting us use his picture of Basil before the Yoko Kanno concert! By the way, he did a great write up about the concert for Ani-Gamers that you should check out! *No not the webcomic GEEZ although it’s pretty cool you should check it out. This entry was posted in Anime Cons, OSMcast, Otakon, podcast and tagged anime con, basil can never look at five guys burgers ever again, five guys, Otakon, podcast by Basil. Bookmark the permalink. Don’t let them shame you my brother. Also Gerald and Daryl can go die of cancer-AIDS for their lack of appreciation in general. Let us just look forward to the Fate/Stay Night remake with Ufotable.